$375,000 I want this Home for Myself!!!!! "Well Appointed & Immaculately Kept Pool Home in Great Location!" Bedrooms: 4 "4th Bedroom Currently Used as Den"
Bathrooms: 3 "1 Ensuite/1 Guest/1 Pool"
Size: 3,121 sq. 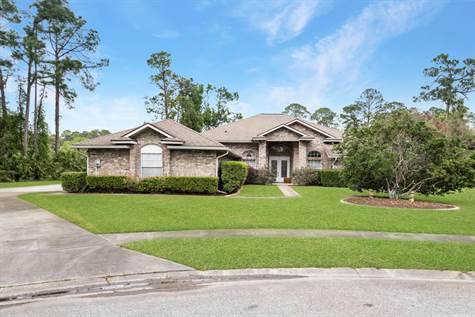 ft. "Under Air/4244 Under Roof"
This BIG brick beauty is perfect for entertaining and/or for the large family. Four bedroom split plan (4th bedroom currently used as Den) & three full baths & a 3 car, side entry garage on a HALF ACRE lot at end of Cul-de-sac. Lots of room to spread out. Family room with fireplace, Formal living room, and HUGE Dining Room - or switch living and dining rooms and have a HUGE formal living area! The possibilities are endless. Welcoming Pool area with jetted spa and enormous covered lanai. Open kitchen with white cabinets has newer stainless appliances and granite tops. The Master Retreat includes a massive, ensuite bath with his & her sinks, jetted tub and large step in shower. HVAC 2017 & Roof 2010. HOA is $940 annually and covers basic cable & common areas. All this & located in the midst of Everything Daytona Beach has to offer, like: the International Speedway & One Daytona; institutions of higher learning; restaurants; shopping; major roads; hospitals; museums; the Hard Rock Cafe Hotel; and, of course, the ''World's Most Famous Beach!'' And just an hour to Orlando Theme Parks! All information is deemed correct but not warranted & measurements are approximate. Home is selling as is with inspections gladly welcomed.